THE YOGA BARN’S BEST SELLER! 10 Punch Card applies to yoga and meditation classes at the Yoga Barn and never expires. That’s right, it never expires! Save $50 by getting the 10 Punch Card. A $150 value only for $100! 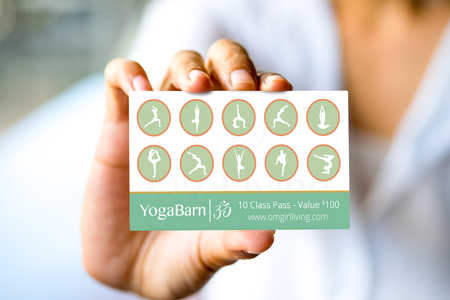 When you buy the 10 Punch Card from our shop, you’ll instantly save $5 off on the next 10 yoga or meditation classes you attend at The Yoga Barn. Select your classes by going to our schedule, check out with “Pay At Door,” and you’re good to go! Simply show up to your registered class and they’ll punch your 10 Punch Card for you!